I've had a morning tweaking my blog, which was mostly inspired by a lovely experience I had over Christmas. I was searching for a small, hand-made gift for friends and family and had tagged Releaf Paper in my Etsy favourites. Heather's work had caught my eye for two reasons - her beautiful lettering style, and one of her pieces uses my favourite Mary Oliver quote. We had quite a few conversations back and forth, and I could tell that she loved her work as much as I do. Her desire to make each of her pieces as best it could be resonated with me deeply. 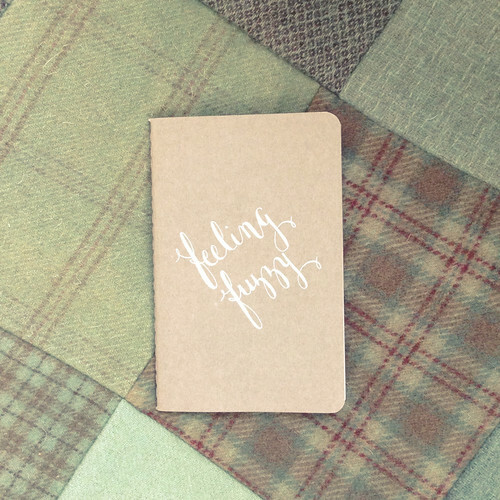 A few weeks later, after I had received my orders a surprise landed in my mailbox - a small grey moleskin notebook inscribed with Feeling Fuzzy. It is a treasure... sitting on my desk, reminding me to be one hundred percent heartfelt in all I do. And so, with Heather's very kind permission, I have re-jigged my Feeling Fuzzy logo with her beautiful lettering... much cosier and gentler in appearance. The surprise moleskin by Heather from ReLeaf Paper. Sure! The whole concept around Releaf Paper was born out of two passions: a love for all things eco-friendly and typography/calligraphy. I started Releaf after my husband gave me a calligraphy set for Christmas and, after finally taking it out of the box, realized this was more fun than I expected! I wanted my calligraphy to be accessible and fun, not stuffy and stiff. I wanted it to be something that would catch the eye but feel comfortable at the same time. The paper I chose had to be something that I loved, which helped me turn my love into a small business. When I get to sit down and put pen to paper, I am truly in my happiest moments. How did you get started, what inspired you to start "lettering"? My first solid inspiration was my good friend Catherine who just happened to be my 10th grade English teacher. Her business, www.calligraphybycatherine.com, never ceases to amaze me. She never set out to be a mediocre calligrapher but the best there ever was. This makes me approach my love of lettering differently, causing me to treat it almost as a reverent prayer rather than just a hobby. I want to improve, always, but have fun doing it just as she does. What is your current inspiration? Currently I am inspired by song lyrics, poems, artists like Emek, Katie Daisy and Pen and Paint on Etsy as well as pinterest boards that feature broad ranges of typography and lettering. Right now my favorite song lyrics are those by Death Cab for Cutie and Mumford and Sons. What have been your favourite projects to date? Oh gosh. So many. I penned a first dance lyric for a couple’s one year anniversary that was so sweet and then also a large version of the Mary Oliver quote for someone’s wall. I love putting together place cards for weddings because the text is so flowy and dreamy. Honestly the little notebook I made you was one of my favorites! Gray paper and white ink is so lovely. You have used one of my favourite Mary Oliver quotes upon your moleskine journals: “Tell me, what is it you plan to do with your one wild and precious life?” How does this inspire you? I think about my children when I read this quote. How I want them to explode like firecrackers in this life instead of sailing on through it. I think about this business and how I want to become as precise as I can be while smiling all the while. And I think about how the life we create is so temporary and precious as Mary writes. How every moment should be savored and enjoyed, jumped into with both legs. This quote has always made me want to be more, do more and enjoy the time I have to do it. One of Heather's lovely books, adorned with Mary Oliver's famous poetry.